LOKI: SORCERER SUPREME PART 5! Get ready for a super-powered wizard’s duel in the Mighty Marvel Manner! 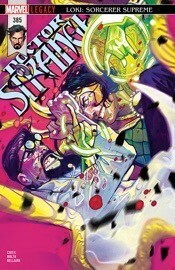 Loki, Lord of Liars, versus Stephen Strange, the former Sorcerer Supreme! And this time, way more is on the line than the title. Will Loki gain the spell so dangerous, Stephen even hid it from himself? And how will Strange pay for the magic he’ll need to defeat a god?